Former NFL player Jarrett Payton and his Jarrett Payton Foundation recently paid a visit to Fulton elementary to surprise urban Initiatives work to Play and play with potential program participants with over 200 athletic balls as a donation, giving them the tools to BE healthy and active student athletes. As a U-Haul filled with bags of brand new athletic equipment pulled up to the school, Jarrett and Trisha Payton began unloading their donations. Fulton students eyes lit up as they entered the cafeteria and saw Jarrett and Trisha with so many brand new basketballs, footballs, volleyballs and of course soccer balls. These donations will give boys and girls fun new ways to work on teamwork, communication and most importantly building new friendships with their fellow classmates. 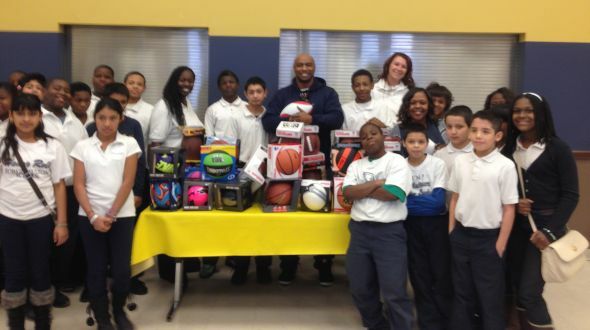 Urban Initiatives along with the students and faculty at Fulton Elementary would like to thank Jarrett and Trisha Payton along with the Jarrett Payton Foundation for their amazing donation! Previous Article: Baby It’s Not so Cold Outside Thanks to Knoll!